TTR warmly welcomes guest blogger Claudia Stanek. Claudia, a fine poet, has spent time in Bialystok, Poland. Today she discusses Scattering The Dark, a collection of poetry by Polish women. Welcome, Claudia! In the anthology Scattering the Dark (White Pine Press, 2015), Karen Kovacik has collected 115 poems written by 31 Polish women poets, the vast majority still living, writing, and publishing. From Nobel laureate Wisława Szymborska to younger poets such as Agnieszka Mirahina, All of these poets are well-published though their names may be unfamiliar in the United States. Kovacik has selected work from diverse poetic styles: formal, free verse, and even neo-Language. There is also one poem composed in English, by Ewa Chruściel. This anthology follows two other anthologies of Polish women poets’ work: Ambers Aglow: Contemporary Polish Women’s Poetry edited by Regina Grol (Host Publications, 1996, in English and Polish) and Solistki edited by Maria Cyranowicz (2009, Polish only). Scattering the Dark features poems translated into English without the original Polish side by side. Editor Karen Kovacik has translated more than half of the poems in this volume. While not translating their own poems into English, many of the poets included in this anthology are translators themselves. In collecting these poems, Kovacik has created eight sections: “Lifting the Veils of History,” “In the Theater of Dreams,” “Reimagining the Bard,” “The Ironic Art of Poetry,” “A Gallery of Myths and Masks,” “Transitions, Transformations,” “The Domestic Arts,” and “Curating Objects.” She introduces each section with a brief annotation. Kovacik has selected poems and poets representative of life under communism and post-communist capitalism, as well as aspects of women’s lives as far back as World War II and up to this decade. One challenge in translating Polish to English is that Polish does not use articles. The distinction of “the” from “a” comes instead from the complexities of Polish grammar and the context of word choice. As a poet and linguist, I can say from my very limited experience in studying Polish that its grammar is extraordinarily difficult to master. There are seven “cases” used under very specific rules which may appear arbitrary to non-native speakers of Polish but are absolutely essential to the expression of the language. English has no corresponding way to treat these cases. you strained so tall to reach each line to grow. line, one devoid of home or dogs or mothers. How I wish the original Polish were on the opposing page, not to hyper-analyze and compare the rhyme scheme and meter between both languages, but to have a visual appreciation for both Kuciak’s original and Kovacik’s translation. The lack of the original Polish is my only criticism of this anthology. And finally, “Manuscripts / are fragile. Though they won’t burn, his [the proofreader] / one careless move will turn them into”. That last preposition leaves the English-speaking reader to draw a conclusion (or not). 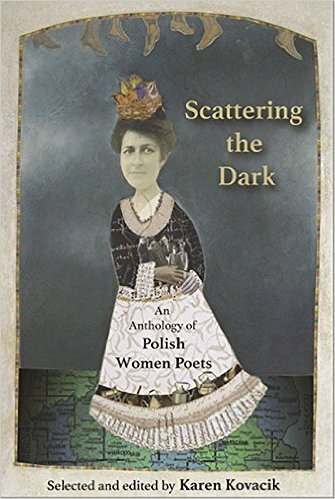 Scattering the Dark is a solid exploration of contemporary Polish women’s poetry in translation. A bit about Claudia . . .
Claudia M. Stanek’s chapbook, Language You Refuse to Learn, was a co-winner of Bright Hill Press’s 2013 annual contest. Her work has appeared in Bitterzoet, Ithaca Lit, Sweet Tree Review, Redactions, and Ruminate, among others. In 2010 Claudia was awarded a Writer’s Residency in Bialystok, Poland, where her work has been translated into Polish. Her poem “Housewife” was selected for a commissioned libretto by Judith Lang Zaimont for the Eastman School of Music’s 2009 Women in Music Festival. She holds an MFA from Bennington College. Claudia lives among the birches in East Rochester, NY with her rescued pets. Do you have a favorite woman author you’d like to blog about? Let us know . . . you could be TTR’s next guest contributor. Let’s keep the conversation growing!